Introducing iOS 4 to the iPhone was a large step forward for the iPhone and iPod touch. It introduced important features like multitasking and folders to the iPhone and now Apple is finally bringing it to the iPad. Like with the original release of iPhone 4, as a developer I was able to get a beta version to test out on my iPad to see how it works. Quite a few of the features introduced to the iPhone in iOS 4 came out on the iPad at launch, like the wallpapers and iBooks. I’m only looking at the major features that are finally coming to the iPad for the first time. Multitasking Originally, you could only run one app at a time on the iPhone and iPad, but now, you can listen to Pandora while reading your iBook or drawing with Doodle Buddy. Double tapping the button shows you running apps and lets you fast switch or quit the apps. Brightness, Side switch and iPod controls The side switch no longer locks the orientation of the display, but mutes the iPad, like it’s smaller siblings. Instead, double tapping the button and sliding left displays a brightness slider, iPod controls and and orientation lock. A pretty slick design and easily keeps these controls out of the way. Game Center Apple finally introduced their online game matchmaking service. With the limited number of games that use it, and the lack of people who use it, I haven’t been able to use it to its fullest, but feel free to add JustJon on there and play a game with me. Folders The folders finally come to the iPad. 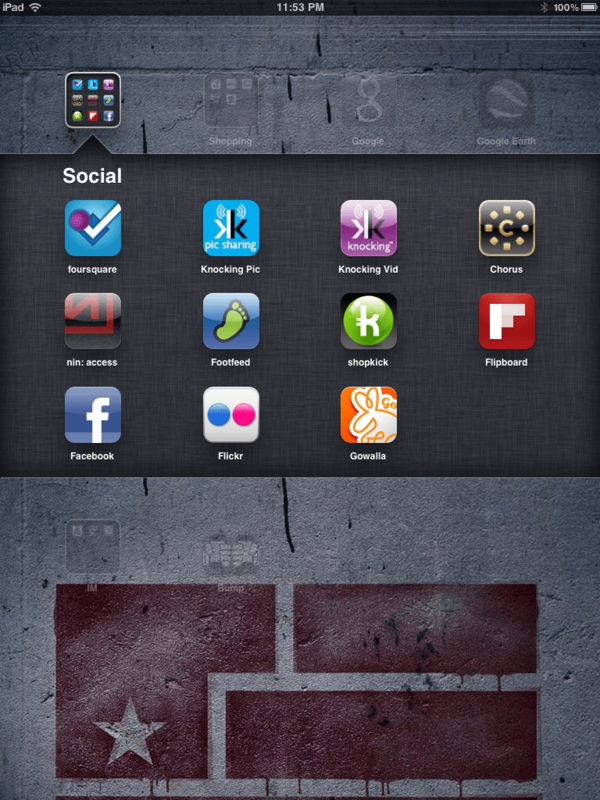 Organizing apps into usable groups and shortens the number of screens needed. In addition to the larger number of apps that fit into the folder, there is also more room to put titles and I can be more descriptive with the names with truncation on screen. Threaded Mail Apple Mail takes a step closer to Gmail by allowing threaded emails by subject. Very convenient for tracking long conversations. Does not sync 100% properly yet, but clicking refresh usually fixes that. I expect bugs in a beta release, so I expect to see it fixed by the final release in November. AirPrint The iPad takes one more step closer to being a better productivity tool by allowing printing directly from the iPad. So far, the only apps I have that can print are the Photo and Mail apps, but I expect to see it in more apps as time progresses. AirPlay So far, I can only connect to my Airport Express to play music remotely thru, but I really want to see it work directly with my iTunes. I’d love to play my iTunes library remotely instead of just playing my iPad content. I also expect it to work with my AppleTV when the new AppleTV comes out soon, but I won’t know if they update the ability to do it until they release an upgrade to my trusty AppleTV. Find text in webpage When on a webpage in Safari, start typing in the search box and a link at the bottom allows you to search for the word within the page. Once selected, a bar appears at the bottom to select previous and next instance or adjust the search. As Apple introduces more features, the iPad becomes closer to being a stronger productivity tool. Folders, multitasking, AirPrint and other features continue to progress the iPad into a stronger devices that situates well between the iPhone and the Macbook.